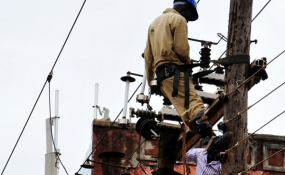 Umeme workers installing a transformer on an old electricity pole in Kampala recently. When Uganda’s privatized electricity supplier shuts off power to hospitals, the results are catastrophic. In 2012, 150 babies on oxygen concentrators at a hospital in Jinja died after utility company UMEME Uganda Limited turned off the electricity with no prior notice. In 2015, Kiboga District Hospital was without power for over a month. UMEME disconnected the supply because the government of Uganda had not paid the bill of over 100 million Uganda Shillings (US$26,600).